Professor John Hartley reflects on the idea of the creative city, and how the Creative Citizen project and associated initiatives in Creative Cardiff connect with the international research agenda. It was a treat to visit Cardiff this year in time for the annual miracle of spring flowers, a season that is capped off (for me at least) when Alexandra Gardens, just opposite JOMEC’s Bute Building, is festooned with cherry blossom, tulips and forget-me-nots. In the spring sunshine it’s not difficult to see contemporary Cardiff as a Creative City. But it has not always been so easy. For a long time – while I was a student here in the 1970s, for instance, or working up in the Valleys in the 1980s while moonlighting as a cinema projectionist at Chapter – Cardiff wore a different expression, perhaps more in keeping with the incessant rain of gloomy November. The decline of the docks, steelworks, industrial workforce and Victorian housing stock was not matched by adequate inward investment – apart from the Atomic Weapons Establishment in suburban Llanishen (making Cardiff a prime nuclear target). The city was sorely in need of a creative makeover. But improvements didn’t come overnight. A lesson learnt from those days is the importance of public policy settings to kick-start the process. The motor of change would need quite a few kicks before it would start. In the creative field, changes in broadcasting policy saw a short-lived but pioneering experiment in 1980. Community-owned Cardiff Broadcasting Company won the city’s commercial radio licence. CBC’s moment of glory came in the blizzard of January 1982. Cardiff was ‘snowed in’ for a couple of weeks and CBC became the voice – and spirit – of the whole population. People rang in with news (e.g. where to get milk), to exchange stories and advice and to apply community pressure to antisocial behaviour or profiteering. The city witnessed itself and its people as one creative, resilient and good-humoured community, somewhat to its own surprise, perhaps. Even though it had been designated as Wales’s capital city in 1955, no-one had yet captured the idea of Cardiff as a city with its own identity (albeit united only in adversity). Another change in broadcasting policy – famously Margaret Thatcher’s only U-Turn – was the establishment of S4C in 1982, and with it a boost for media production companies in some of the now-empty buildings around the former coal exchange in Mount Stuart Square. Further policy changes brought the BBC’s UK TV drama production to the city, making it a backlot for Dr Who. But perhaps the best-known regeneration initiative came in the 1990s, when I was back at Cardiff University and living in Penarth. The Cardiff Bay development took a while to warm up (and to flood the mud, which our house overlooked). But eventually it too bloomed as a place, not just a development, attracting creative venues and companies back into the long-abandoned docks, especially around the grand old Pier Head Building where the Welsh Assembly, Millennium Centre and Harry Ramsden’s fish’n’chips were all within easy reach. Meanwhile, despite years without a coherent urban plan - according to John Punter, in Forging a new connection: Cardiff and the valleys - Cardiff’s city centre morphed into a thriving mall and entertainment district, especially at weekends when the place teemed with incomers from the Valleys. None of this occurred without setbacks, criticisms and even the occasional scandal. But even so, Cardiff evolved into a different kind of place, albeit not one that has tended to sing its own praises. There was gritty self-deprecation and faux-nationalism, from Max Boyce’s rugby songs to Chris Amodeo’s inspired Taffywood and ‘I Loves the ’Diff’, which even sells bottled Cardiff rain. As the website puts it: 'if you get it, you're in the clwb'. But as for branding the place ‘Creative Cardiff’, that seems to remain a funny, fragile and foreign idea. And that is just one reason why Creative Cardiff at Cardiff University is such a good idea. So much of what is truly creative about the place is fleeting: flowering today and forgotten tomorrow. It comes and goes (like the weather); but it doesn’t alter the underlying patterns and drivers of community and civic wellbeing (like the climate). Change is either dependent on periodic top-down government intervention (often by the UK rather than Welsh government), or it remains at the level of ad hoc, unorganised initiatives that have a had a hard time – or have taken a long time – to cohere into a creative critical mass with its own momentum. But meanwhile, the concept of the creative city is faring well elsewhere. Across the world, consultants, city planners and officials are investing in creative initiatives to boost their city’s competitive ranking. My own research team has uncovered no less than 23 different ways to define and assess a creative city – and then, for good measure, we’ve added one more Creative City Index of our own. 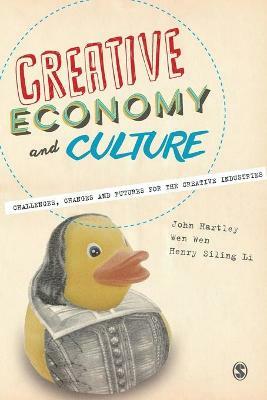 I’ve also been involved in intensive research on the creative economy and culture, teasing out the sources of creativity within the context of globally connected market economies and digital technologies. The quest has been to understand how innovation connects with culture and how creativity works at system level. The Creative Citizen Unbound, co-edited by Ian Hargreaves and myself, and published by Policy Press. It turns out that the source of creativity and innovation is invariably cultural and community-based before it is economic and enterprise based. That’s because humans use culture – including language, social relations, meaningfulness and identity – as the mechanism for making groups, which in turn are the vehicle for creating new ideas, knowledge and technologies. Innovation is the process of adapting to change and uncertainty, and it works at system level, i.e. only once a new idea is taken up and used across a social network. It’s not enough simply to invent; intellectual property is worthless until it is wanted, and you can’t tell in advance which artist, idea or IP will catch on. In the era of the internet and social media, moreover, inventions (new ideas) are much more widely distributed than ever before: innovations can emerge from anywhere in the system, or they can come from different or competing systems. everywhere (countries at all stages of development, not just advanced Anglophone economies). Policy settings need to be broadened, beyond the traditional purview of industry policy, to take in whole populations (everyone), culture as well as economy (everything), and global systems (everywhere) – in order to understand how complex, dynamic forces like creativity and innovation actually work. Only then can policy support the right drivers of change. Businesses are calling for support, but at the same time it is not as clear as it once was what a ‘business’ actually is. The maker movement, user-created content, micro-enterprises and sole traders working from home, and portfolio careers (where someone puts together a livelihood from a mixture of paid employment, online enterprise and community networks) force us to rethink the whole idea of ‘industry’. Industry policy settings need to stop ‘picking winners’ and encourage the formation of groups, clusters and hubs where people can work together, team up different skills, and support each other’s activities to produce ideas and experiments for the future. Education and training policy need to support and skill up independent producers, not just prepare people for workforce employment (which routinely means exporting young, ambitious talent). R&D needs to pay much more attention to ‘bottom-up’, self-organising systems, rather than throwing money at incumbents. Cultural policy needs to support community-based micro-initiatives as well as national cultural institutions. Investment policy needs to shift beyond ‘The City’ to many cities, nurturing a reticulated enterprise culture throughout the country (a trick that German enterprise policy learnt long ago). Policymakers need to think as much about cooperation as competition, and about emergence as much as evidence. This kind of shift – a ‘paradigm shift’ in scientific thinking about what drives a creative economy – is too important to be left to business-as-usual agencies in government or industry. It needs community and educational engagement too. It has become increasingly clear that higher education itself plays a pivotal role. Globally significant phenomena like Silicon Valley could never have emerged without a Stanford University to back them up. More generally, higher education has become a leading branch of the creative industries. In some countries it is the leading export sector in services. In Australia, where I live now, it is the third highest export earner after iron and coal. And in many cities, not only are universities among the largest employers, but also their students supply an army of early adopters, experimental consumers and potential entrepreneurs – some of whom may stick around long enough to enrich the city as well as themselves. It follows of course that universities need to invest in the creative transformation of the cities where they themselves are such prominent ‘corporate citizens’. Creative Cardiff is an example of that imperative in action. It is tapping into the community-led creativity of those who work and play in the city, rather than attempting a top-down corporate branding exercise for the usual suspects. It is building and connecting a network of creative people and enterprises across the city and beyond, as a self-organising and self-sustaining system for sharing support, information, learning and exchange. It is developing a Creative Cardiff hub to encourage creative enterprise across all kinds of activities. It supports R&D in creative innovation and collaborative connections with international partners (including me!). Thereby, it links Cardiff to a global research and policymaking community whose collective insights can point to pitfalls, as well as calling attention to new opportunities and models. Creative Cardiff’s various schemes are coordinated by a dedicated team. It combines senior figures of national and international repute, such as Ian Hargreaves and Justin Lewis, with on-the-ground activists, organisers and researchers, led by Director of Creative Economy Sara Pepper. Together with partners and ‘creatives’ around the city they are mapping, networking, clustering and enabling Cardiff’s creative activities from the bottom up. Between them they are role models for a can-do approach to creative enterprise, informed by cutting edge research and venturous experimentation. They provide another reason why it’s not so strange now to love Cardiff, and not just in springtime.